Rather than spend an exorbitant amount of money on a vacation, SuperPhillip Central spent a fraction of that for Bandai Namco's Go Vacation on the Nintendo Switch for its review. See why this activity collection is worth your time and money. 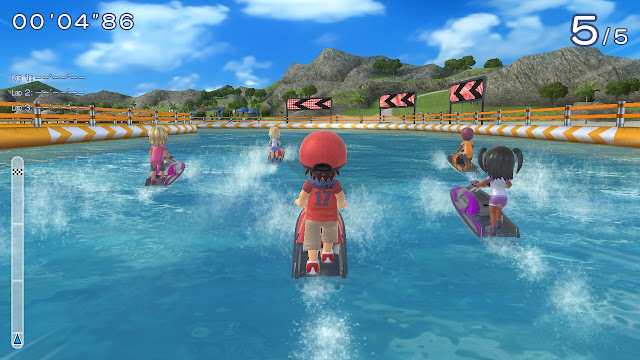 A perfect game for a summer "staycation"
The original Go Vacation released on the Wii way back in 2011, and out of all of the games from the Wii era that I expected to get reincarnated in HD, Go Vacation was certainly not one of them. That said, I can't say I'm disappointed, as Bandai Namco's answer to Wii Sports Resort was one of more thrilling and enjoyable games of its type on the system. Perhaps a little too ambitious for Nintendo's under-powered system, but enjoyable nonetheless. 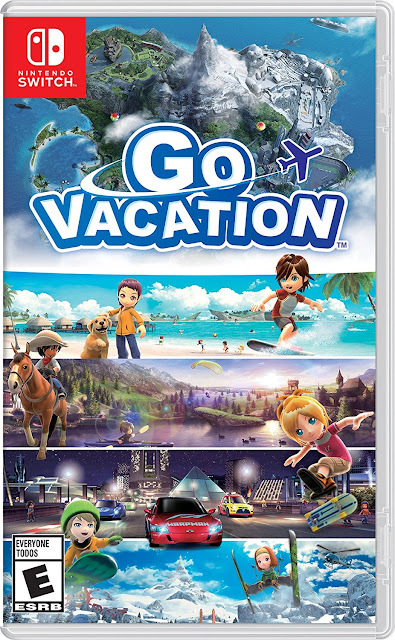 Now, Go Vacation makes its grand return from the Wii to the Switch, offering new bonus features and the same party and family-friendly gameplay that the original brought to players. Is this the type of vacation you'll have fond memories of or recurring nightmares over? Go Vacation starts you off in style with a skydiving descent to Kawawii Island. 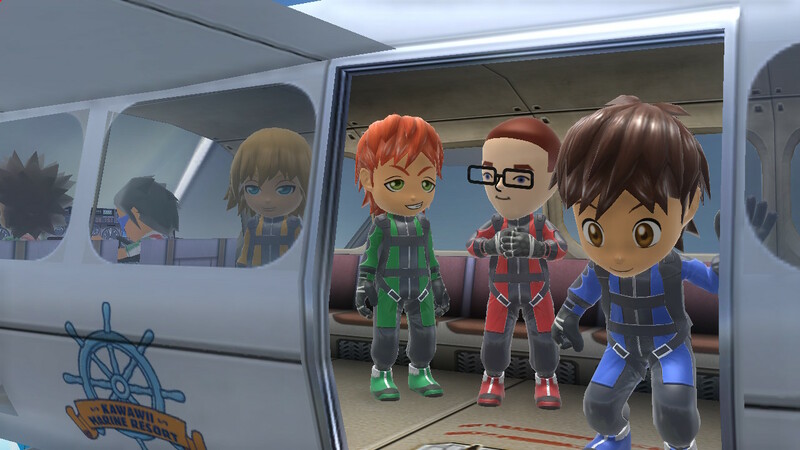 Go Vacation provides players and their custom avatars (either Go Vacation models or their Miis) a ticket to Kawawii Island, home of four resorts that can be fully explored as they're unlocked one by one through filling out your stamp book. This stamp book is filled as you participate in the various activities that each resort has. Alongside completing activities, each resort allows you to traverse it by foot or by one of its many means to get around, such as the Marine Resort's Marine Bikes and ATVs or the Mountain Resort's horses and off-road vehicles, for instance. Outside of finding each activity a resort has to offer, there are plenty of places to exercise some excellent exploration--from chatting with the locals, taking photo ops, finding treasure chests in each resort, and taking photos of the wildlife for your collection. Wave Race this is not, but Go Vacation's Marine Bike races are still riveting all the same. The activities in Go Vacation run the gamut of things to do, and while the game leans more towards "quantity over quality", a great number of the activities in the game are winners. 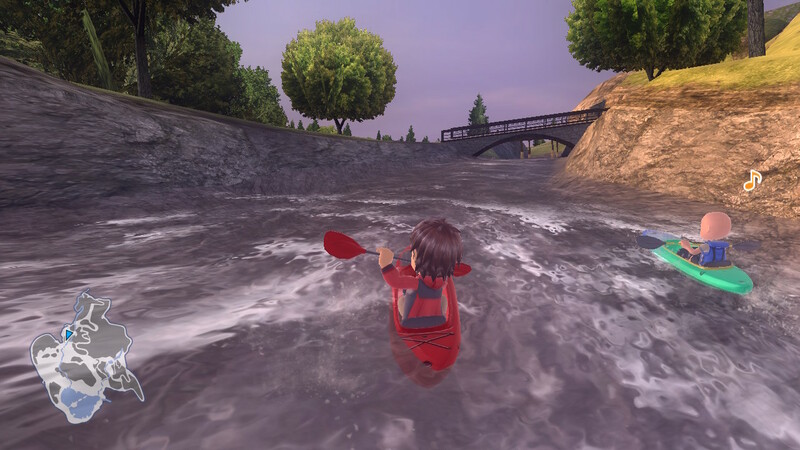 There are races and time trials across a plentiful amount of vehicles and things to ride, such as marine bikes, ATVs, Ridge Racer-like vehicles, rally cars, horses, kayaks, snow tubes, snowmobiles, and much more. Then, there are non-race activities such as tennis, beach volleyball, skydiving, mini golf, table hockey, scuba diving, paragliding, and many more. Most activities have several different modes to them, such as horseback riding that contains both races and a mode where you collect as many coins as possible within a time limit, or snowboarding that has you pull off as many successful tricks as possible either in halfpipe or grinding form. 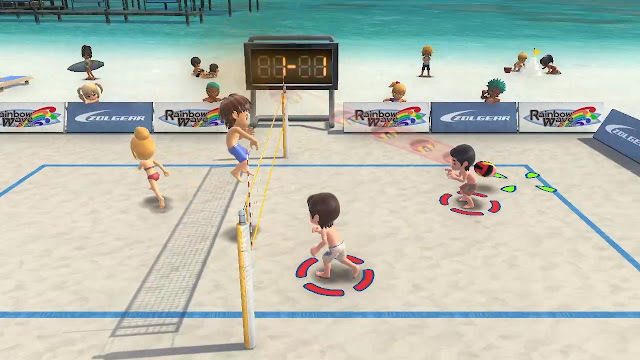 It's another day at the beach for my partner and me as we challenge these AI scrubs to a game of beach volleyball. When starting out an activity for the first time, Go Vacation defaults to the easiest control method available. 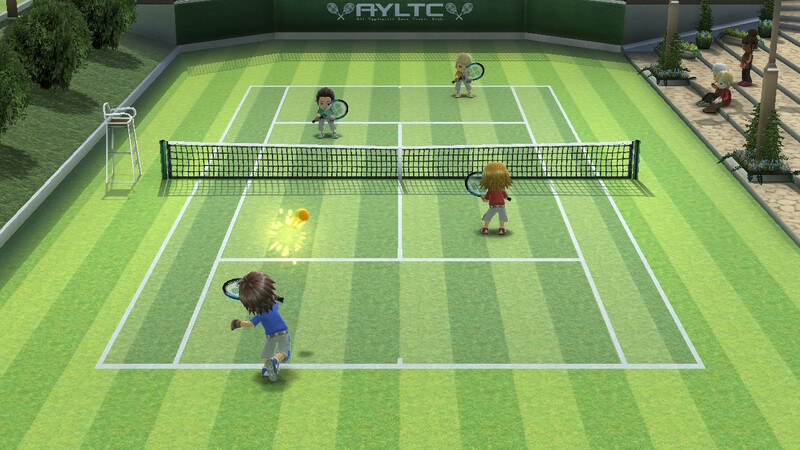 What I mean by this is that in tennis, for instance, your character moves automatically to the ball with your job merely being to swing and select the appropriate shot with the right timing. However, once you complete the first stage of the mode and return to it again, you have the option of free-roaming and whether or not you use traditional controls or motion-based controls. When first playing tennis, your character moves on his or her own. It's not until you replay the activity that you get the choice of full movement. The latter controls were pretty much a requirement for the original Wii version of Go Vacation, so it's nice to see an option here. That said, some activities like performing certain tricks in skateboarding, for instance, still require you to shake the controller to pull off a trick, or in the case of bailing, motion controls are required to get back up. Activities in general are easy enough to learn regardless of what type of controls you're choosing to use. In case you forget what each button does or how to perform a certain maneuver, you can pause the activity at any time and enter the "How to Play" menu, which is a tremendous help for those who aren't as familiar with playing the Switch or playing video games in general. In ATV races, you'll certainly be using the "All-Terrain" part of "All-Terrain Vehicle." Completing all of the stages in a given mode in a given activity of Go Vacation rewards you with experience points that has you gaining levels. Each level you gain grants you a key to unlock one furniture set of your choice to customize your villa in an Animal Crossing-like way. You have multiple rooms to work with, multiple house designs at your leisure, and you can share your creations online for others to "heart" or "like" depending on how impressive your creativity shines. I found myself absolutely addicted to plopping down furniture in such a way to make my villa the envy of the block. A nice aspect of Go Vacation is that any activity you've already played is available to select from the main menu without the need to enter a resort, track down the character who hosted the activity, and then play from there. Being able to choose from the main menu cuts out a lot of the hassle that would otherwise be given to players. One unfortunate aspect of this, however, is that if you want to jump in to any activity you want right at the beginning of Go Vacation, you cannot do that. You have to play most activities within resorts in order to unlock them in the main menu. Did your friends really want to try out rafting ASAP? Well, sadly, you have to unlock it first, and that's in the last of the four resorts that unlock within your Go Vacation experience. Bust out your inner Tony Hawk in the Grind Master activity. The Switch version of Go Vacation adds remastered textures, but all in all, the game is very much underwhelming in the visual department. It's literally a higher resolution Wii game and not much more. Also included in the Switch version are daily rewards in the form of new furniture, gear, clothing for your avatar, and new dog breeds to pal around with on Kawawii Island. During play on resorts, sometimes a plane will arrive overhead and drop some cargo in the form of a present that can be collected for a special reward. This feature is also exclusive to the Switch version. By far, though, the thing that makes the Switch version so special compared to the Wii original is something that I've already touched upon in this review, and that's the option (well, for the most part) of choosing between motion controls and traditional controls. Though, speaking of controls, it's a bit bewildering that the right analog stick isn't used in the game for camera control. Instead, you have to hold a shoulder button and use the left stick to move the camera around your avatar. This was how it worked in the Wii version, if memory serves correctly, so it's like Bandai Namco just brought the same control scheme to the Switch game despite an opportunity to change things up for the better. I wouldn't say it's lazy, as it's more of an oversight that I wish would have been rectified now that the Switch controller has more buttons and inputs to it. Paddle till your heart's content as you ride the raging river of the Mountain Resort. Multiplayer is strong in Go Vacation, whether you're playing with someone who has never picked up a controller before, someone well versed in gaming, or anyone in between. You can not only play any activity together with up to four players, but you can also explore Kawawii Island's four resorts together as well. All of this can only be performed locally with no online play to speak of, save for ghost data of other players to compete against once the credits have been viewed. Still, if you've got family and friends nearby who like a good time, Go Vacation will give them just that. Go Vacation succeeds at bringing a compilation of appealing activities and events, as well as some truly engrossing exploration to the Switch. 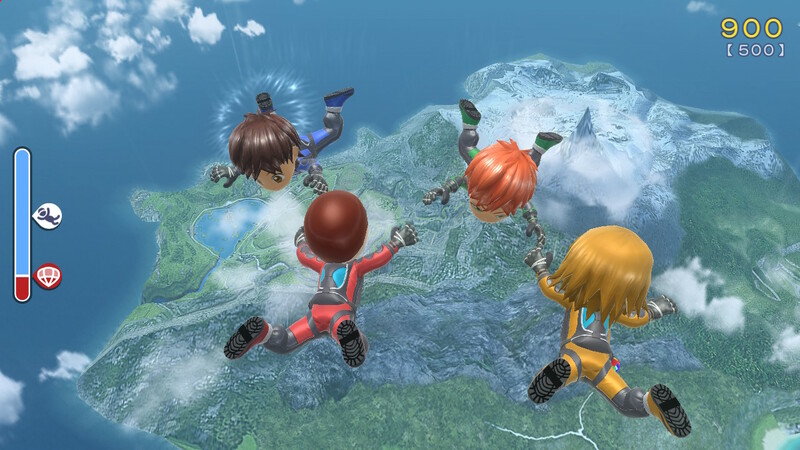 It improves on the Wii original while offering plenty of new content to make a second look at the game worthwhile. While this particular vacation won't replace a trip to the Bahamas or Italy, it is cheaper than a round-trip ticket and won't put you at risk for a nasty sunburn.